MK Introduction to Maps and Photos (25 Sep 2002): Well, 21 months after I should have had this page's map to post, here it is. It shows all the hills near the Imjin River and familiar to me when I first started the IBB - with the single exception of the ominous Hill 317. Hill 317, at CT 179220 just west of the left edge of this page's map, always seemed to be looming over all of the hills around it. I knew nothing of the doings on Hill 317 before 24 Dec 1952 when I first saw it and it was then firmly held by Chinese troops. Also, when I first started the IBB, I knew nothing at all about the doings, at any time, on Hill 355, a/k/a "Little Gibraltar" and "Dagmar". 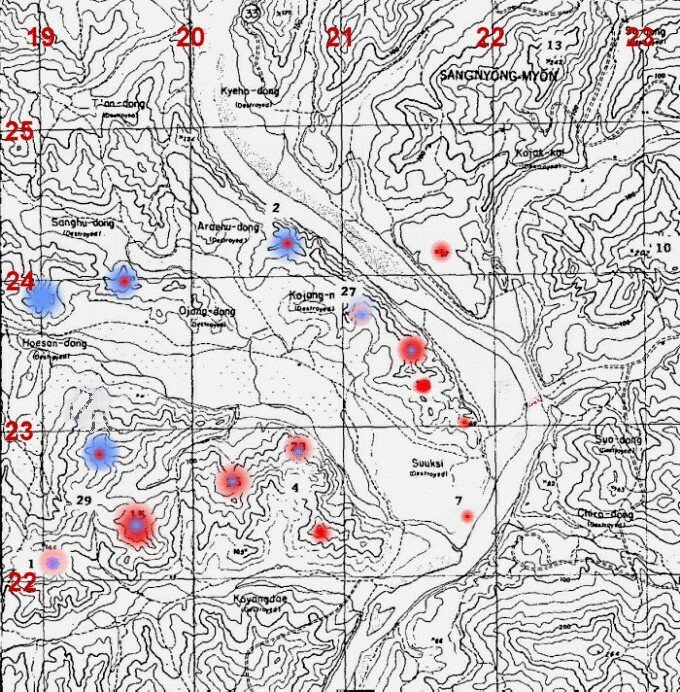 Hill 355 is at CT 174189, south and west of the bottom left corner of this page's map. So, when I started the IBB, I envisioned that only those hills on this page's map would be included in the term "our hills" or be included in the area of interest for finding more buddies to jump in the Bunker. Then, along the way, I learned that some of the 15th Inf Rgt guys who had made an entry into the Bunker had also served on Hill 355 and that it was the lynchpin upon which all of "our hills" depended. Therefore, Hill 355 belonged in my "our hills" definition and any KW vet who served on or east of Hill 355 belonged in our Bunker even though he had not been on or near Kelly or east of the Imjin. That fortuitous realization meant that some of the "lads" (English, Scottish, Welsh, Australian, Canadian, and tell me who else) in various Commonwealth units had fought for Hill 355 in the battles whereby it first became one of "our hills" and so ..... well, you know the rest. I regret that time and wherewithal restrictions prevent me from stretching the area of our hills west of Hill 355 or further east if the Imjin River; but, it does appear that I must be (reluctantly, or not) dragged along with the 65th Inf Rgt and the 3rd Bn of the 15th Inf Rgt to the hills upriver and along the Imjin for a little distance after its bend to the northwest past where the Ferry is indicated on the map. As Rhee Dong Kun might say, "No more of number ten yappity-yappity." (9 Oct 2002): J. C. Poe (#2) has cropped off a section of the above map and, on it, he has marked some locations which lie east of and along the Imjin from its island at CT 212218 to just south of the Ferry. Those locations are of interest not only to the Bunker guys of Co A/15/3, which were there for most of the winter of 1951-1952 and early spring of 1952, but also to many other Bunker guys and "lads" of other units which were there also at times when Co A was not there. (31 Oct 2002): Poe now has furnished five photos to go with his map. Those photos are on the Able on the Imjin page along with some tales of life along the Imjin during 1951 and 1952. I ain't gonna leave out Hill 355, Sergeant Poe, any more than I would leave out Hill 317. Soon to appear will be a page which does for the area along the 1951-1952 MLR, from just west of Hill 355 to the island in the Imjin you see on this page and from south of Hill 355 to the north past Hill 317 and the other hills of interest to the guys and lads in our Bunker. I will need lots of help in the identifications and hill nomenclature for that new page - I was never west of Kelly except for some trips to Breadloaf. Sherwin "Arc" Arculis (#6) has done his part and I will try to get the page underway soon. Meanwhile, the "Our Hills" 1951-1952 Map page, linked to below, gives the big picture: a map of nearly all of "our hills". There you will start finding links to all the map pages, including those which tell a story or history of the mapped area. Also, you may visit Cpt Pearson's Map to see a copy of the map he carried on his person while commanding Co A of the 15th Inf Rgt during the winter of 1951-1952 when it was positioned along the banks of the Imjin. On that map, he later marked, for our benefit, the location of more of "our hills" (shown but not marked here) lying west of the Imjin and, roughly, between Kelly and Nori ("Big Nori" to some).